Hindsight bias is a term used in psychology to explain the tendency of people to overestimate their ability to have predicted an outcome that could not possibly have been predicted. In essence, the hindsight bias is sort of like saying "I knew it!" when an outcome (either expected or unexpected) occurs - and the belief that one actually predicted it correctly. Here are some examples of the hindsight bias phenomenon. On the evening of an important World Series game, your friend predicts that the Red Sox are going to win by a large margin. In fact, the Red Sox do end up winning the game, causing your friend to boast "I predicted it!" A letter comes in the mail informing an individual that he was accepted into a college. When he tells his mother she says, "I really had a feeling that you were going to get in" (even though she had expressed doubts to his father earlier that week). An individual notices that outside, it's beginning to look a little bit gray. He says to himself, I bet that it's going to rain this afternoon. When it actually does rain, the individual tells himself that he was certain that it would when he saw the clouds rolling in earlier. You are nervous to take an exam for which you waited to study until the very last minute. When you take the exam, you feel unsure about the results; however, when your grade comes back a B+, you exclaim to your friends, "I was sure that I'd aced that exam!" and actually believe it in hindsight. On a snowy night, a police officer predicts that it's the perfect condition for a teenaged driver to get into a fender-bender. When the police scanner says that a driver who had just received her license skidded into a mailbox, the officer tells himself that he had been certain such a thing would happen on that night, of all nights. Three friends decide to bet on a horse race. One of them breaks from the other two and chooses a horse with very low winning odds, saying that he has a good feeling about that horse. The long shot ends up winning, prompting the friend to claim he'd been certain of the outcome. A young lady waits for a telephone call from a gentleman she's given her number to several nights before. In spite of his not calling for three nights, he finally does on the fourth. The girl's best friend says, although it took him longer than expected, she knew that he would call eventually. 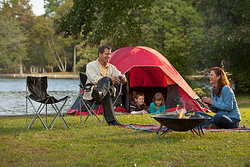 When gearing up to go camping, a father says that he just knows someone is going to forget something. It turns out that his son forgot his fishing rod. "I was sure it would happen," says the father. After a long night out, two friends stop at a diner. One orders coffee and the other says, "you might feel tired now, but that's gonna keep you awake, I bet." It actually happens, and the second friend insists that he was sure it would. A boy sends a poem into a popular poetry journal and says he thinks he has a good shot at getting published, even though deep down he doesn't believe it. When he gets the acceptance letter, he immediately replies that he predicted it. Now you have lots of examples of hindsight bias from everyday situations. If hindsight bias is something you or people you know engage in, you'll be better able to recognize this phenomenon in the future. "Examples of Hindsight Bias." YourDictionary, n.d. Web. 19 April 2019. <https://examples.yourdictionary.com/examples-of-hindsight-bias.html>. Hindsight bias is a term used in psychology to explain the tendency of people to overestimate their ability to have predicted an outcome that could not possibly have been predicted. In essence, the hindsight bias is sort of like saying “I knew it!” when an outcome (either expected or unexpected) occurs – and the belief that one actually predicted it correctly.